At a tiny test track in Crowthorne in Berkshire, a Citroen hurtles round a test track at speeds of up to 80 miles per hour. Conservative politician Lord Hailsham sits in the front, and theatrically takes his hands off the wheel to read a newspaper. The steering is hydraulic, making hisses as every corner, and the car stays level and steady as it steers, piloted by sensors in the front and back. The driverless car is reliable enough for the engineers to persuade the government to prepare for tests on the M4. The ‘car of the future’ - driverless, safe, piloted by electronics - had arrived. 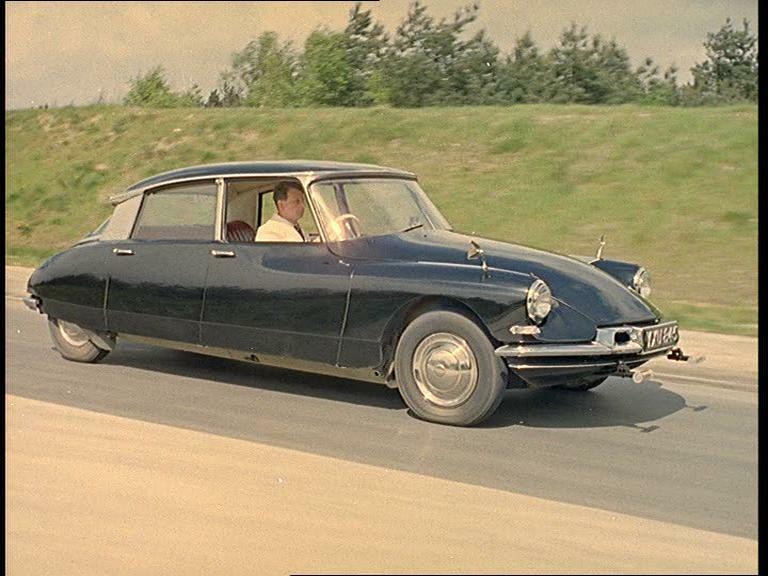 But the maiden voyage of the driverless Citroen DS was nearly half a century before the UK government announced the first tests of driverless cars on UK roads, scheduled for the end of 2013. The Transport and Road Research Laboratory tested its cars - a Citroen, plus Minis and a Standard Automatic - from the turn of the Sixties onwards. Looking at the 1960 Citroen DS - still intact, and shown off at a rally in Harrogate last year - it’s a rather different technology from today’s driverless systems. The back seat provides room for a huge instrument panel covered in knobs and dials - under the steering wheel sits a large, square box which plugs into the car’s hydraulic steering, suspension and brake systems. The car is steered by magnetic sensors on the front and back - and drives along a magnetic ‘rail’ hidden under the road, like a Scalextric track. The hurdle the engineers faced - and ultimately failed to clear - was how to make the machine change lane. “It hadn’t seen the light of day in thirty years,” says photographer Hans Staartjes, a Citroen enthusiast who persuaded the Science Museum to show off the car at a rally last year. Like many ‘new’ ideas, the driverless car is anything but. Facing the threat of congestion, several projects began to research ‘autonomous’ vehicles in the Sixties. In 1969, the French governement began researching Aramis, a system that ran on magnetic rails, where drivers would sit in their own driverless carriage and join a ‘train’ of similar ones on the way to work. Backed by defence companies - like many early “driverless’ systems - it was a costly failure. In 1995, a Mercedes van drove 1000 miles from Munich to Copenhagen, overtaking other vehicles and changing lanes - using cameras to ‘watch’ the road, and computers to steer. The technology used was the forefather of many of today’s most talked-about driverless systems, including Google’s prototypes. Several states have now offered ‘licences’ for Google’s cars - which drive on roads with a dummy in the front seat to avoid terrifying other drivers. So far, Google’s cars have been involved in crashes only twice - once with a human at the wheel, and once when a ‘Google car’ was rear-ended at a crossroads. The company points out that it is currently focusing on refining its technology, rather than selling it to the public. Google is in discussions with several car companies. Google’s theatrical demonstrations - letting a blind man ‘drive’ their cars - might not reflect how a ‘real’ driverless car would work, though. The LIDAR systems - laser radar - used to pilot Google’s cars are expensive. Radar boxes and cameras are far cheaper than scanning multibeam lasers. Other, cheaper systems seem likely to take the wheel in ‘real’ cars first. BMW has driven a driverless model between Munich and Nuremburg. Both BMW and Audi predict driverless cars will be on the road this decade. Nissan, Ford and others also have their own systems in development. Mercedes new S-Class Limo uses 26 sensors including radar and stereo 3D cameras to build a ‘picture’ of the road. It recognises numberplates, and ‘assists’ with steering, braking and acceleration. The S-Class isn’t ‘driverless’ - if you take your hands off the wheel, it bleeps a warning - but it offers a significant helping hand.